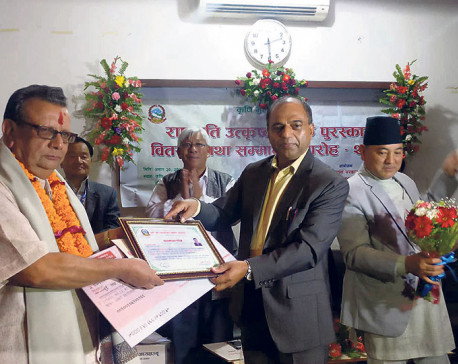 KANCHANPUR, Nov 16: The District Agriculture Development Office, Kanchanpur, on Tuesday honoured three farmers in the district with Best President Farmer Award. At a programme organised at Agriculture Service Centre on the occasion of 36th World Food Day, the DADO, Kanchanpur, honoured fisheries Bandhuram Chaudhary of Belauri Municipality-2, vegetable farmer Hariram Chaudhary of Krishnapur Municipality-9 and poultry farmer Ambadutta Awasthi of Bedkot Municiplaity-9. Senior Agriculture Development Officer at DADO, Kanchanpur, Tikaram Thapa, honoured the farmers with Rs 10,000 each. Meanwhile, winners of district-level inter-secondary school essay competition held on the occasion of 36th World Food Day were presented with cash prize.